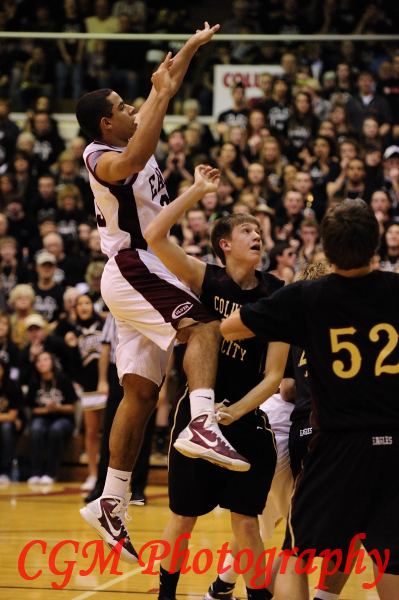 Photos from Culver Academy’s Basketball Win at Semi-State! Ginny and I traveled to Huntington to see the Culver Military Academy’s basketball team play in the semi-state game. This was one of the most intense experiences we’ve had as photographers. We were so caught up in the game, in the noise from the fans, and by the close score throughout that we had a hard time maintaining our focus on taking pictures. We saw so much class and heart on the basketball court during this game, and we also felt that the coaching on both sides was impressive. The Columbia City Eagles played well. They were especially good at the three-point shot, but any time they came within giving the Culver Eagles a threat, the Culver team would step up the defensive intensity and show great patience and team play on offense. They simply wouldn’t give up their lead in the fourth quarter. We were also impressed by how many students showed up after a long bus drive to show their support for the Culver Eagles. They never stopped cheering throughout the game, and they never lost faith in the team. They chanted often, “We believe that we can win.” It was remarkable to see so many people in the stands. Faculty, alumni, and parents showed in great numbers. For the first time ever, the Culver Eagles captured a semi-state win to take the team to the state event next weekend. We captured this game and plan to attend the state event. All of the photos are free to anyone who wants to download them. If you know a player, be sure to let him know that he can have any of these shots for free. Congrats Culver Eagles! You made your school and town proud! This past weekend, in addition to shooting the Culver Eagles basketball game, Ginny and I shot one of our favorite people, Lyndsey Fisher, and her fiance Brandon. Lyndsey and Brandon are getting married this coming July. We’ll be traveling to Florida, as Ginny is going to stand up in the wedding with Lyndsey’s mom Jeanine and one of Lyndsey’s friends. I’ll be photographing the wedding ceremony and reception. I think these two are going to make a beautiful bride and groom. As you can tell from the pictures, they take a great picture. Lyndsey worked for CulverLodging her junior and senior year and became more than an employee to us. She’s much like our own family. More than once I tried to chase off Brandon, but he didn’t let me shake him. I have to respect a guy who can put up with more than one of me in his life, as Lyndsey is surrounded by a lot of people who have a lot of love for her. It can’t be easy being the finance. We look forward to their wedding day and hope they like their engagement pictures. We enjoyed shooting them and giving Brandon a hard time for being an IU guy while Lyndsey is a Purdue gal. We didn’t have the best weather conditions, but these two take a great picture. Ginny says it’s all the love going on between them and their “smiling eyes.” I tried to tell her it’s the photographer, but after looking at these pictures, I think Ginny is right. I guess I better stop giving Brandon a hard time. Wow what a busy schedule! Last weekend, Culver Academy’s Prep Hockey Team hosted a tournamanet with six visiting teams from the U.S. and Canada. I attended (with my camera): 4 games, 1 locker room parent’s open house, a party, a ceremony for the seniors, and an awards ceremony. For me, it meant close to 15 hours of shooting, 3000+ photos to sort through, and at least 12 hours of editing. I was tired by Sunday night, but I can’t forget that there were others who probably worked harder over the weekend than me. A big shout out to Keith, Greg, and Rosie, the trainer. All three were there at the rink every time I was. The last game of the season is always a little sad for me with any team, as I get to know many of the parents and kids. For the seniors, this is especially true as it was their last game with their team and most likely the last time that they’ll play in the Henderson Ice Rink. After the last game of any season, you can see the emotion on the kids’ faces as most realize this fact. Culver played well in the tournament taking second place overall. They played against UCC, Ridley, NSA, and St. Louis. Culver easliy won their first three games, but they struggled in the final game on Sunday with St. Louis. 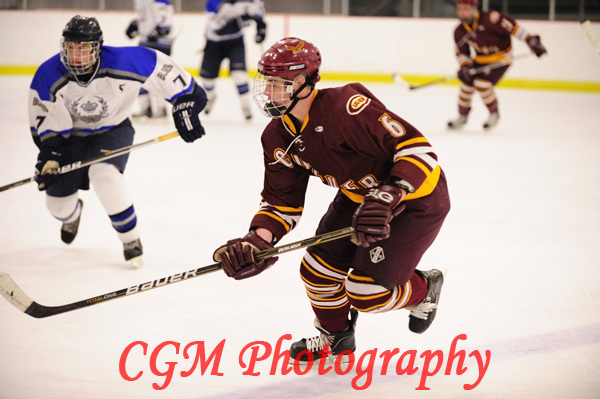 A few weeks ago, I photographed the ten seniors on Culver Academies’ Prep Hockey team. Using their photos, I created senior banners that the team hangs during their senior recognition night. In the past year, I’ve done similar banners for some of the other sports teams. When printed, these really are sharp and life-sized! Let me apologize if the image quality doesn’t appear as crisp as one would expect. I had to shrink my original files (3 foot by 7 foot) to an image size that would actually load by most browsers. I’m sorry if the title for this blog is confusing. I’m an Indiana-based photographer who was asked to do the team photos for a St. Louis based hockey team. But… I did this while the team was in Indiana playing a U12 hockey tournament at Culver Academies. 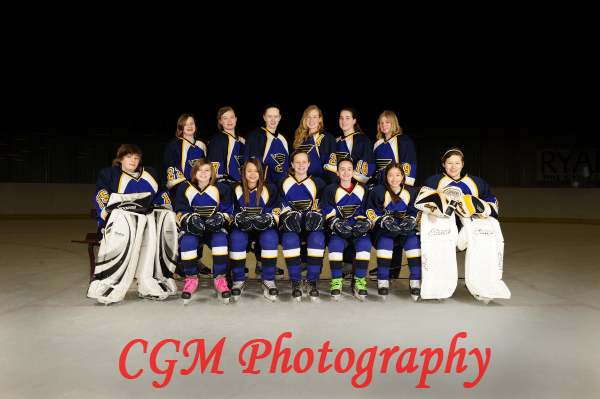 The St. Louis Lady Blues U12 AAA Hockey Team has kids that participate from six different states. Because of this, the girls do not practice together. Additionally, all the girls belong to local teams in their own home towns and often have to miss games. Because of this, the 13 girls almost never play together. Given that the season is almost over and everyone was able to attend the Culver tournament, they decided it was time for a team photo and individual shots of the players. With limited time on the ice, we rushed through and managed to take three seperate sets of photos. We took team photos (players and then players with the coaches), individual shots, followed by individual action shots where the kids sprayed ice as I photographed them. Considering that each set required moving lights, backdrops, and getting the kids posed, I am surprised that we got through it and things turned out as well as they did. Last weekend, Culver Girls Academy hosted a U12 Hockey Tournament for three of the best AAA U12 teams in the country with the St. Louis Lady Blues, the Ohio Flames, and the Compuware U12 team from Michigan. As this was a U12 tournament (kids 12 and under), Culver did not participate. Culver was merely a host for the tournament. 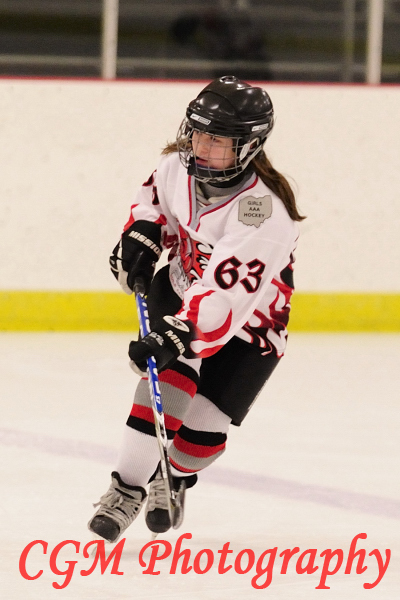 Watching the U12 girls was a lot of fun for me as I have never watched a non-high school or pro hockey game. The kids did very well and truly have some great skills that I’m sure will take them far if they stick with hockey.